Heading out at 4 a.m.
A few weeks ago, Rosie and I went on our first long road trip together to Sonoma, California to attend a friend’s memorial. 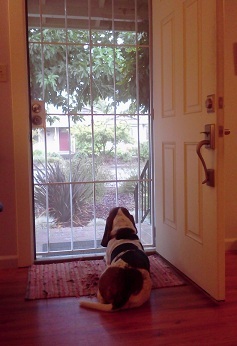 Rosie regularly goes on errands with me when I go to dog-friendly places (PetSmart, Gangplank, my aunt’s house, etc.) but this was our first multi-hour drive. Since she’s a frequent rider, I got her some nice car gear – a quilted seat cover and a car harness to keep her from going flying if I have to slam on the brakes. We pulled out of the house at about 4 a.m. and headed north. I don’t know how other drivers sit for 6 hours at a time; my legs get too sore and my bladder is too small for that. 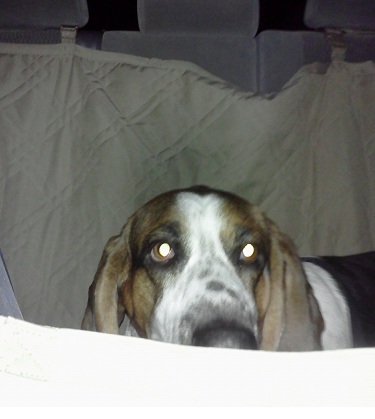 Having Rosie in the car made it even easier to make sure I stopped every 2-3 hours to let her stretch her legs, go to the bathroom, and have a drink and a snack. I learned Rosie doesn’t like hard dog treats while driving. She wasn’t even interested in having some of my apple slices. Her preferred road trip snack is pieces of boiled chicken. It was also funny to watch her react to the different types of grass at each gas station. We have short dry grass in Phoenix but the farther north we got, the grass was taller and more lush. You could barely see her feet at one place we stopped. We also passed a dairy farm on the drive. You can smell that place miles before you get there. Rosie was immediately standing up with her nose in the air trying to take in the new (and very strong) smells. We definitely knew we were in a small town when we out for our first walk to the plaza. 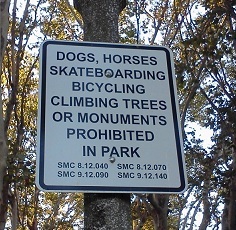 There’s a beautiful park in the town square, but we were greeted by signs that said, “Dogs, Horses, Skateboarding, Bicycling, Climbing Trees or Monuments Prohibited in Park.” A park where you can’t bring your dog and you can’t climb trees? WTF?! (Apparently they’ve had trouble with people’s dogs killing ducks; I’m not sure why they’re anti-tree-climbing.) We walked around the edge and visited with people who were out for their morning coffee. I hoped to take Rosie to a dog-friendly beach to see how she’d react to sand beneath her feet and the sound, sight, smell, and cold of the ocean waves, but it rained the morning we were planning to go. So we decided to have a mellow morning instead. 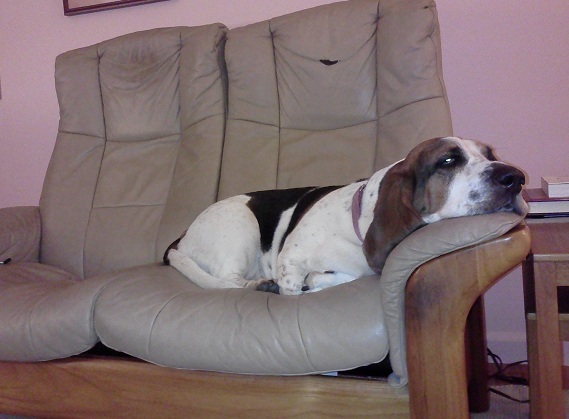 I made a run to the grocery store and when I got back I saw she had found a Rosie-sized seat for herself on the couch. She knows she’s not supposed to be on the furniture, and she usually respects this rule, but I couldn’t help but say, “Aww…” when I saw this. Our drive back to Phoenix was faster and uneventful – 12.5 hours total. I thought about breaking the drive up over two days but I was ready to get home so we pushed on. Rosie was very happy to be back in her familiar environment. Traveling with a dog requires extra time, extra planning, and it limits how much time you can be away from them. I’m glad I had this experience with Rosie, but I’m not sure I’ll do it again. Rosie handled the drives really well, but I think she’d rather go to camp (aka the kennel) instead of road tripping with Mom.